Berlin is not just made of Berliners. It is made of other cool personalities, places & events – Berlin is diversity. This year, we want to take a closer look and discover why Berlin is so important to the many creatives who decided to come, live and work here. In the end, we want to know what it is that makes Berlin so special for all of us. 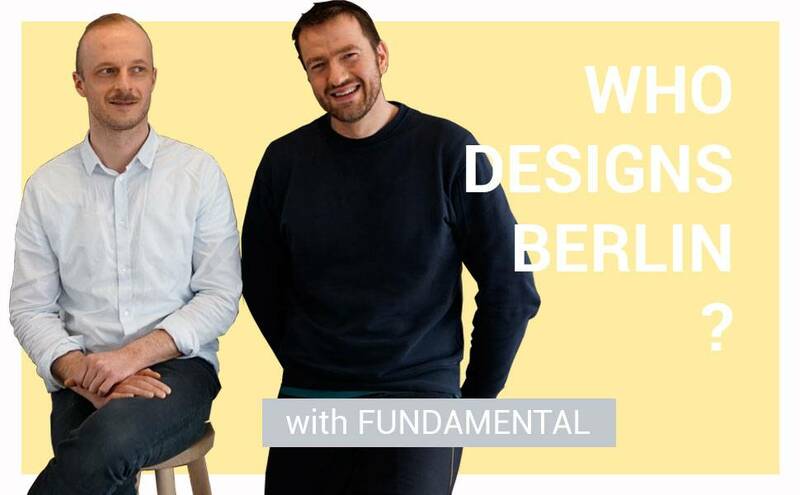 We started our little interview series with Gunnar and Stephen from Fundamental Berlin. Which makes total sense, because Fundamental was also the first design studio we approached when we started of/Berlin. Even if you haven’t heard of Fundamental yet, we’re pretty sure you’ve already seen some of their products, like their beautiful “Regenbogen vases” or the “Push bowl” which is already being sold at the MOMA shop in New York (cool, right?). In general, Fundamental is creating mathematically inspired furniture, objects and architecture in their Berlin-Mitte studio. When you go through the interview, you will soon notice that the two of them are very different. That’s exactly what works so well for them. They complement, challenge and inspire each other – a perfect match! 1. Why Berlin? What does the city mean to you? Stephen: Berlin is an opportunity to make mistakes. Where we have the space and the time to experiment what works and what doesn’t work. It has given us the space to develop. Gunnar: Berlin is not built as fixed as e.g. London or New York or even Paris. So there is a lot of physical and mental open space. 2. Does Berlin affect your work? Is it relevant for your work? Gunnar: It’s definitely relevant for us. Berlin is a place where a lot of creatives come. And their doing inspires us a lot. 3. Does your work affect Berlin? How? Gunnar: We sure hope so! Stephen: Yeah it does! One of the nicest parts that we do is, turning up at a stranger’s house when you’re invited for dinner and you see a piece that we’ve made and that person has no idea how they got it, ‘cause someone gave it to them as a present. That’s a really nice moment, because you see how something, that was a thoughtful gift of a friend and how it enters their life and you get to see it from the outside. And of course, because what we do is quite affordable, we see it popping up a lot in our day to day lives. 4. Which place in Berlin inspires you the most? Stephen: One of the places that really inspires me on a really reliable level is the Philharmonie. When you go and see a group of people who have practiced and practiced and have this combination of discipline and passion, that all gets released in one night – it never fails to inspire me. 6. About you: Would you like to give us a little sneak peak of what to expect from you soon? Stephen: This year is going to be all about glass. We have a few different manufacturers that we’ve worked with and we’re testing the possibilities we have. The glass products we have so far have been quite successful so we really want to see what we can do with the material. So we have looked at different ways of coloring glass. There will probably be a tea pot and some more crystal stuff. Gunnar: and if we then have time, we might even put more effort and energy into furniture! 7. Quick and dirty: Who designs Berlin? Stephen: Because the chief of firemen sets regulations for how things should be his influence is much more dominant than any esthetic decision. Like how high buildings can be how far apart they are from each other. These decisions are also broadly cultural and not scientific. These people have more effect on the city than Schinkel or Friedrich der Große or David Chipperfield. Stephen: I don’t like restaurant, but I hate Cocolo the least. Gunnar: I love restaurants! And I really love a good pizza. My favorite is the Standard in Prenzlauer Berg. Gunnar:I like the Hellsee which is around 45 minutes from here and not as crowded as other lakes in Berlin. Stephen: I have two 1) Habermannsee perfect for after work because you can get there in 20 minutes and 2) when I’m more ambitious I go the Bernsteinsee. This interview series is a cooperation between Awesome Berlin and of/Berlin.